Does this balsa strip bend? Midwest Gollywock? 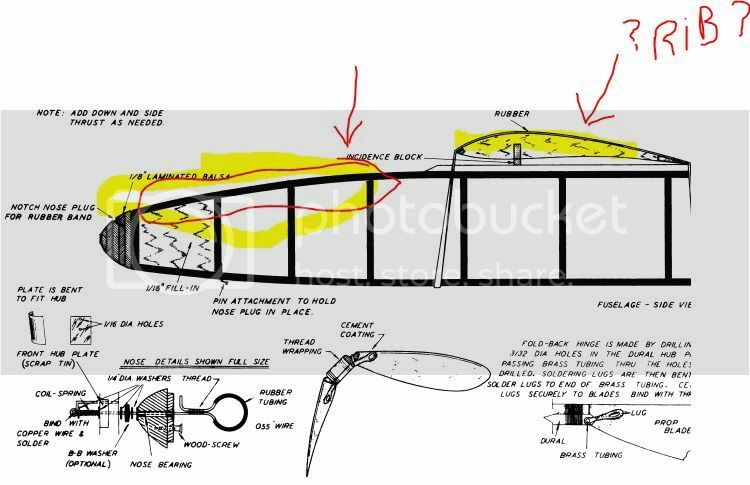 Hip Pocket Builders' Forum > Outdoor Free Flight Forum > Outdoor Building Tips and Problem Solving > Topic: Does this balsa strip bend? Midwest Gollywock? Do I bend this balsa strip section so it matches the curve on the plans? I did this earlier and it snapped. What am I doing wrong? Is this section supposed to be comprised of multiple strips laminated together? Can I fix my busted strip (its already glued in place with the cross members. Re: Does this balsa strip bend? Midwest Gollywock? I'm looking at three of my Gollywock fuselages and none of them are using laminations to hold the shape of the longerons. I have to ask what does the grain on your longerons look like. If it is "C" grain (spotty short grained) then the wood isn't apropreate for longerons. I like to use nice straight "A" grain wood. If you feal that the longerons might bounce back once you un-pin the sides you could lightly brush some water on the longeron and come back the next day to allow the longeron to dry prior to lifting the sides off the building board. No, you don't want to use broken longerons. If you do make a splice with a run of about 10:1 or add a splice to the break. I'm doing a Gollywock now. Just steam it to the bends front and back as close as possible. I use a kettle previously broken by holding the 'thing' down to get a constant stream. No need to complicate things, and it takes about 20-30 seconds. And you only need medium straight grain wood - I'm surprised it would snap. 1. first evaluate the wood you used for this part. Does it break or crack very easily? (I suspect it does) ... if yes then I would scrap this fuselage side and start again with stronger wood (this is time consuming yes, but it saves you a lot of hassle down the road when you are flying). 2. If no then I would either: a. position the strip forward of your crack so that it is aligned with the rest of the strip and the crack is closed to the point of being nearly invisible. I would then apply a small drop of very thin CA (super glue) which will soak into the crack and knit it back together stronger than it was before. or b. slice off the cracked end with a clean, vertical, diagonal slice across the longeron just aft of the crack. Make the cut with a sharp blade. Splice in a new segment of longeron being careful to match the angle of the diagonal cut etc. I prefer option "a" over option "b". 3. Now that the Longeron is repaired I would split the longeron lengthwise using a stripper or a steel rule and sharp blade. The split should extend back to the crack at least but works best when it extends just beyond the curve you are trying to make. If you have the skill you can even make two cuts to get three spit ends but two ends should be enough. I do this with all fuselages that require a strong curve near the nose in side view. 4. You will now find that it is easy to bend the split longeron to the curvature shown on the plan; use pins or magnets to hold it in place and to keep the split closed. You will notice that the two split ends are not aligned with the curve in place (the inner one sticks out more than the outer one) this is fine as you will trim them flush after you apply thin glue to the split or seam in the longeron. Apply thin glue (I use very thin CA) along the length of the split in the logeron, letting it soak in. Once the glue is dry the longeron is now set at this curvature permanently and there is no tendency for it to spring back to its former shape. I usually do the upper longeron as my first step, setting any curves using the method described above. When I have the entire upper longeron shaped and held firmly in place I then set the cross pieces in place by butting them against the upper longeron and trimming them to the length using the edge of the lower longeron shown on the plan. With all of the cross pieces held in place I then set the lower longeron in place, using the split end procedure described above if needed. Once the entire side is set up and held in place I then go through with thin CA and add a drop to each joint. If you use other glues you may have to add glue as you go but the basic procedure is the same. If you decide to start again select your longerons with great care. You want springy hardish balsa that flexes. I find that balsa with a density between 8 and 11lb/ft3 works best (select it with a scale so that you can calculate the density and the feel it for flexibility etc.). When you find a good sheet set it aside and use it as your longeron sheet. I also use this harder wood for the cross pieces in the part of the fuselage where I will be holding the model during handling and lunch (front half basically). For the aft end of the model I often use very light wood for cross pieces. ok that's all I have. I also use this harder wood for the cross pieces in the part of the fuselage where I will be holding the model during handling and lunch. I usually put my models down during lunch; I'm likely to take a bite out of the fuselage and chuck my sandwich into a thermal. I will take a closer look at the grain of the balsa (yes this if from a very old Midwest kit, so it might be brittle). I'm still learning my balsa. I have a scale and weigh each 4" by 36" sheet of balsa carefully. Unfortunately a lot of the really light balsa is "mushy" or "punky" for lack of a better word. And the solid balsa can be very heavy. For stripping I try to find sheet of 1/16th x 4" x 36" (10-15g) and a sheet of 1/8th x 4" x 36" (20-30g). I'm not sure how that works out in terms of density. I look for a firm surface on the wood that does not dent easily. When deciding between two sheets, I hold them both out horizontally (like the plank on a pirate ship) and choose the one that sags least. I would think that bending/pinning the strip and gluing it in place would create some "built-in" tension to the frame. Tension that might not be a good thing. I would think that bending/pinning the strip and gluing it in place would create some "built-in" tention to the frame. Tension that might not be a good thing. Yes it does; hence the steaming. I've never stripped longerons from sheet. I buy it square from the model shop (until it closed last week) so I can weigh it and check it. 1) That curve in the Gollywock forward fuselage is not that severe. If you are breaking balsa while setting that curve, you really need to look at the grain and quality of the balsa. 2) When I do need to bend balsa strips, I use household ammonia. I keep a 1" X 36" PVC tube handy that has one end capped and glued, the other has a removable cap. I fill the tube with the ammonia, then just slide the balsa strips into the tube, cap the tube, and wait 15-20 minutes. open the tube and the balsa will float out the top. I can bend balsa really well. When the ammonia dries, the balsa keeps the bend with no stress. I read once that the ammonia liquefies the fibres in the wood. Of course, the smell of ammonia does not bother me. Your results may differ. Starduster; I find UK ammonia works very well on basswood which retains its bend exactly, but has no effect on balsa. It soaks the wood and makes it bendable but it springs back. Ratz edit: fixed quotes code. And one more tip from me. When I'm building a fuselage, after I've got the sides complete, but still pinned down to the board, I give them a good spray with water and let them dry overnight or longer. I do the same thing when added the cross pieces to join the sides. Helps relax the wood so it holds its shape. but still pinned down to the board, I give them a good spray with water and let them dry overnight or longer. I did this with fuselage sides that had bowed enough to upset the decalage. I repined them together back over the plan and sprayed with Windex window washer (weak ammonia solution in water) and left them for about a month . They were fine after this. It didn't affect the PVA glue joints. However in future I would always soak and prebend any longeron that is required to hold a curve - the slight bit of extra work is worth it.